We’re all geeks for Ninja Warrior, right? If we weren’t, we wouldn’t be here right now, reading some random blog from some random guy about his delusional middle-aged aspirations to become the first American Ninja Warrior. Well, for those of us who love Ninja Warrior, the earth has shook and the planetary rotation of the Ninja Warrior orb has been turned on its axis as the entire structure and premise of American Ninja Warrior has changed in the last few weeks. Most of us came to love Ninja Warrior by watching re-runs of Sasuke (incorrectly translated as “Ninja Warrior”) on G4 of the epic competitions in Japan to find the world’s best obstacle course runner. And, yes, it was to find the world’s best obstacle course runner, because although most of the competitors have been Japanese, the producers of the show have always tried to bring in the world’s best foreigners to compete, extending invitations to Olympic athletes in various disciplines to come and try their hands at the increasingly difficult course. They too, like many others, ran and failed at some point in the 4 stage course we learned to love named Mount Midoriyama. In recent years competitions like Sasuke Malaysia and American Ninja Warrior have sprouted up around the globe to become their own events to select the top competitors to get their shot running Sasuke on the hallowed grounds in Japan. For all Ninja Warrior aspirants around the world it was all about getting a shot somehow to run that course in Japan. Now all that has changed (at least for we Americans). With the uncertainty of future competitions in Japan, and the relative success of American Ninja Warrior the last couple of years here in America, the NBC/Comcast entertainment conglomerate has secured the rights to produce American Ninja Warrior as a standalone network program here in the U.S. No longer is American Ninja Warrior a feeder competition for Ninja Warrior Japan, but it is (for the time-being at least) its own bad self standing on its own bad own. Meaning that instead of having 10 Americans going to compete in Japan at Sasuke against the legendary Japanese group of competitors, there will be 100 Americans that will arise out of 6 regional competitions to compete in a new mega-course they are building in Las Vegas. That’s right, Vegas baby. 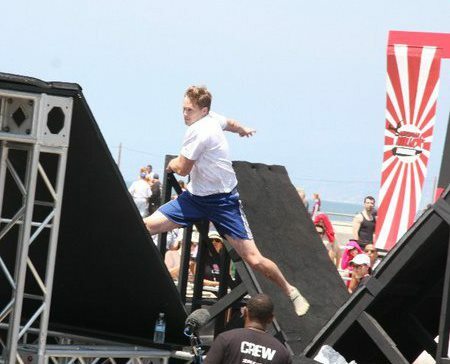 The owners/producers of Ninja Warrior Japan are consulting on the building of the course, which is good news for American Ninja Warrior competitors who have pointed out that in recent U.S.-based competitions the quality of some of the obstacles was lacking. Whether it will be an exact replica of Mt. Midoriyama is unclear, but I believe most expectations are that it will be very similar, and will certainly be composed of many of the iconic obstacles we all love and fear like the Salmon Ladder, the Warped Wall, and the Ultimate Cliffhanger. So 6 regional competitions going down in 3 cities (LA, Dallas, Miami), each with reportedly 125 runners, will happen throughout March to pick the top 100 guys to compete in Las Vegas on this new course reportedly on April 21-22. I believe that there will be some coverage of these regional competitions on G4 before they (for certain) show the 100 person final in Las Vegas over several weeks on NBC this summer. This is supposedly NBC’s competitor for ABC’s very popular Wipeout (although the surest way to see an American Ninja Warrior competitor go apoplectic is to ask them if their competition is similar to Wipeout). This is a major shift in the structure and identity of American Ninja Warrior. It now stands alone, and is no longer the cable network feeder program for Ninja Warrior Japan, but its own bad self (did I say that already?). Competitors and fans have mixed emotions about this, with much loyalty and love being reserved for the original Japanese competition. While I myself am saddened at what is an increasing likelihood that Ninja Warrior Japan will “go away” at some point, I’m glad that there is a strengthened competition here in America that could keep the spirit alive even as the Mother Ship goes into retirement. Below are the locations of the regional competitions, the submission dates for the videos, and the estimated competition dates for those locations (they will confirm and narrow these dates soon). The new season of American Ninja Warrior starts airing tonight, Sunday July 31st, on G4 at 6 pm Pacific / 9 pm Eastern. This is American Ninja Warrior 3 that I competed in at Venice Beach this past May. I doubt my run will be shown, but regardless I’m still tuning in to root hard for my fellow competitors and some good buddies in particular as they pursue total victory in the world’s toughest obstacle course competition!